In Tunisia, this product is called M’hamsa, which translates into sundried wheat grains. Produced in the traditional Berber method, these large grains are hand-rolled and preserved with olive oil and sun, which give them a nutty, earthy flavor unlike any other couscous. Production begins by mixing semolina with olive oil, water, and salt, which is then pushed through screens. Complementary to almost all North African and Mediterranean cuisine, including stews, meat, and fish dishes. 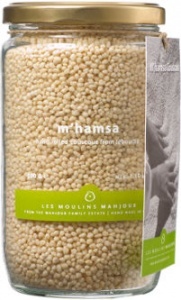 Also delicious with any of the four Les Moulins Mahjoub Couscous Sauces. As with all of the Mahjoub products, this is produced using traditional farming methods with no additives or artificial processes. Merula catches your attention first with its beautiful packaging. Merula means “blackbird” in Spanish, and behind that peering bird’s eye is a buttery, fruity, magnificent olive oil perfect for both cooking and finishing. The quality of this extra virgin olive oil mirrors that of its dressy cousin, Marques de Valdueza. Fine, old sherry vinegars have the depth and complexity rivaling the traditional balsamic vinegars of Modena. Their greater volume and underlying acidity, however, make them more appropriate in culinary applications calling for vinegar. Our Cepa Vieja from Vinagres de Yema has a 40-year-old mother vinegar and will improve any recipe calling for sherry vinegar. It is so deep and complex in flavor that it will surely spawn the invention of new recipes. 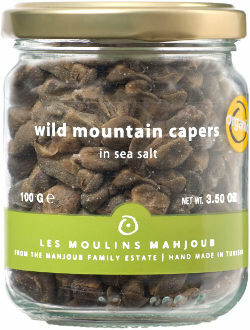 Capers are the flower buds of a native Mediterranean bush that grows in the mountains of Tunisia. Unlike most commercial capers that are packed in brine, the Mahjoub’s capers are dried in sea salt to preserve their distinct flavor. Add them to salad dressings, marinades, cured salmon, and sauteed or grilled fish dishes. As with all of the Mahjoub products, this is produced using traditional farming methods with no addititves or artificial processes. This product is organic.